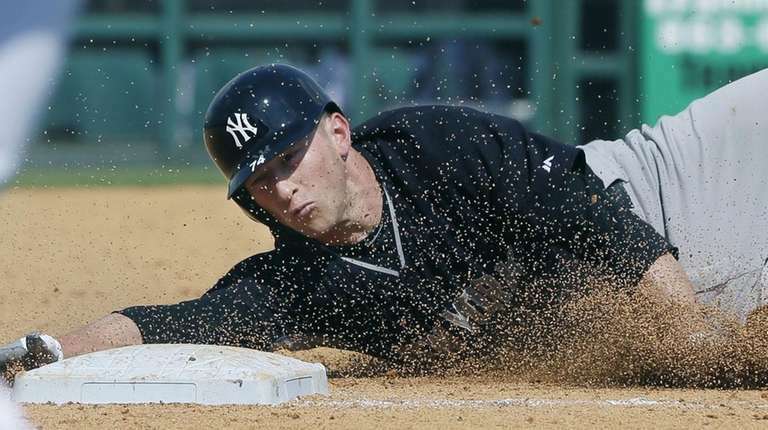 With Jacoby Ellsbury out, will Slade Heathcott step up for Yankees? WASHINGTON - How long will Jacoby Ellsbury be out with a sprained right knee? GM Brian Cashman said by phone Wednesday "it's premature to try and predict" until the centerfielder, who left Tuesday night's game with the injury, is seen by the club's team physician, Christopher Ahmad. "I don't think it's a two-month situation," Cashman said. "Could it be a month? I don't know. Our doctor hasn't seen him." Ellsbury, placed on the 15-day DL, sustained the injury when he swung and missed at a 1-and-0 Gio Gonzalez changeup in the fourth inning. Ellsbury stayed in and later scored a run in the inning but was removed after the inning. "I knew it wasn't right but I was kind of hoping it would go away," Ellsbury said. Ellsbury said the club hasn't given him any kind of timetable for a return. "I think we'll have a better understanding of a timeline when I see the team doctor Friday," he said. Cashman did not attempt to downplay the loss of a player who leads the Yankees in batting average (.324), on-base percentage (.412) and steals (14), but echoed Joe Girardi from the night before. "Obviously, he's a premier player, it's a tough loss," Cashman said. "But, as Joe said, it's a part of the game. It creates an opportunity for someone else to shine." Slade Heathcott, the Yankees' first-round pick in 2009, could be that player. Heathcott, who experienced a difficult childhood and battled substance-abuse issues as a teen, had trouble staying on the field as a prospect, his knee particularly troublesome. The lefty outfielder, 24, was at Triple-A Scranton/Wilkes-Barre. "It's surreal so far," Heathcott said. "It's been a long road but definitely not a boring one."